We want our students to learn the importance of getting out into the community and making a difference in the lives of people around them, putting into practice the Character Counts! pillars of Caring and Citizenship. We participate in several different activities throughout the year that help students gain responsibility and become active participants in the community. 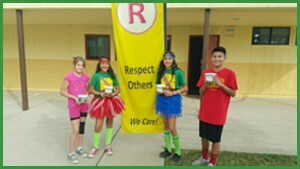 Each year, Cypress joins schools throughout the district to raise money for Tulare’s Lighthouse Rescue Mission. Last year Cypress raised $600.85 dollars to donate to the outreach needs of women and children in our community. Our drive this year was October 19 through October 23. Our goal was to raise $1 per Cypress student, and we did it! With your help, we were able to raise $634! This was a great way for our students to put into practice our pillars of character and show that the Cypress community C.A.R.E.s. Jump Rope for Heart, sponsored by the American Heart Association, raises money to help kids with special hearts. Cypress has had the opportunity to participate in this event for the past four years. This year we raised $3,457 to help the American Heart Association reach its goals and had a great time celebrating our accomplishments at our event. This year Cypress has teamed up with elementary schools throughout the city of Tulare to support our local Tulare Emergency Aid. UFG supports Tulare Emergency Aid in providing meals, clothing, and financial assistance to families. You can purchase your red 2018/2019 UFG shirt in the office to wear on Wednesday! Cypress, together with schools across the district, held a canned food drive for those who needed a little extra help this holiday season. With your help, our Scorpions worked together to collect over 1,180 cans to help our community!